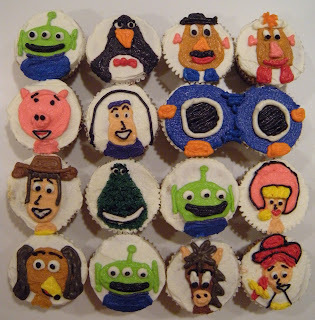 My sister's high school friend Gaby asked me to make these cupcakes for her sister's bridal shower. 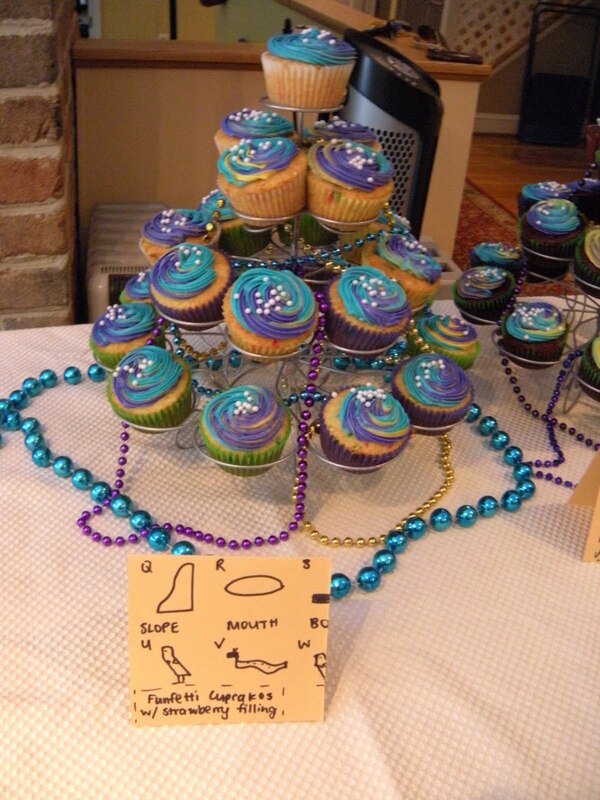 The theme was Egypt because its one of the several locations Gaby's sister and her future husband will be visiting on their honeymoon. 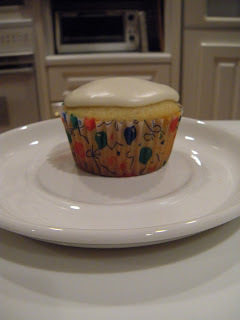 The cupcakes were filled in the middle and topped with vanilla buttercream icing. 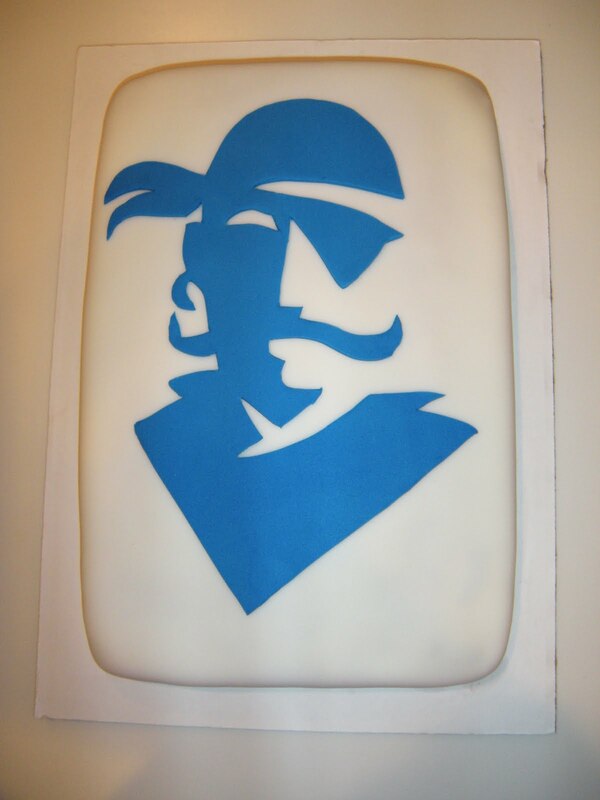 I made this cake for my good friend Zack's surprise birthday party. 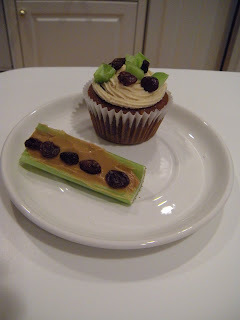 The cake consisted of a layer of brown sugar cinnamon poptarts and yellow cake (kind of coffee-cake-like) and a brown sugar icing. 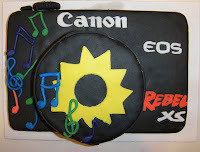 The cake is modeled after Zack's camera, the Canon Rebel XS. Zack will be starting at Northeastern University next week! I made this cake for one of my oldest friends, Margo, who I met back in '98 when my family first moved to Maryland and I started in the first grade. Margo is the sweetest girl ever, and she's going to Carnegie Mellon this year. She had to leave before her birthday, so she had a big party and her wonderful mom, Judy, hired me to make the cake. Best of luck to Margo! 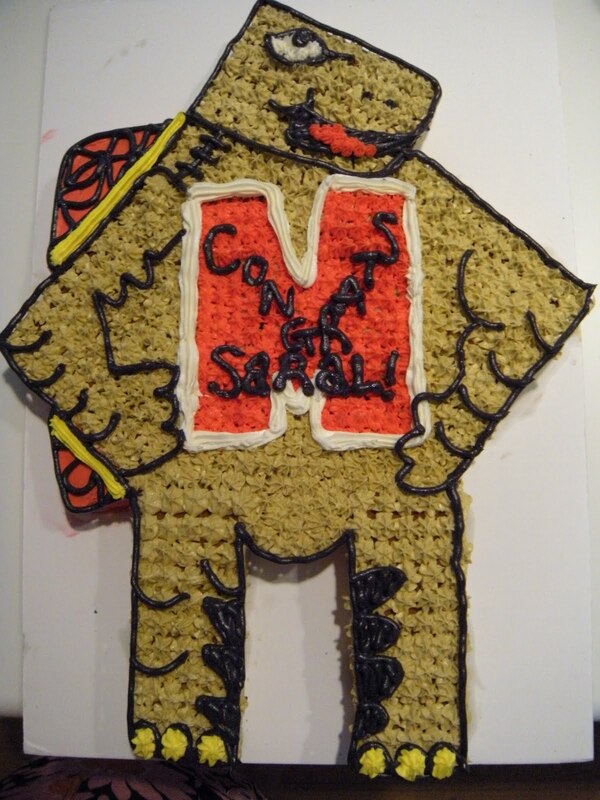 This cake is for an old friend, Saral, who will, as you can see, be attending the University of Maryland this fall. 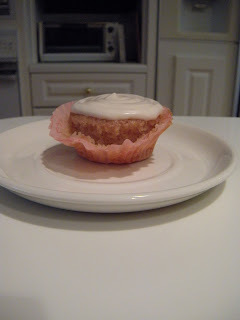 I made these cupcakes with real peaches and peach yogurt in the batter and raspberries in the icing. The icing was a winner, but the peaches didn't provide a strong enough flavor--looks like artificial flavoring would have worked better. 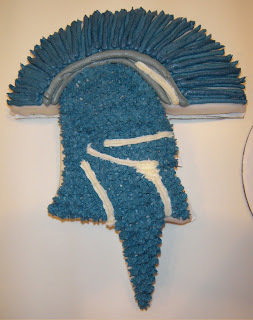 But combined with the icing, it was great! 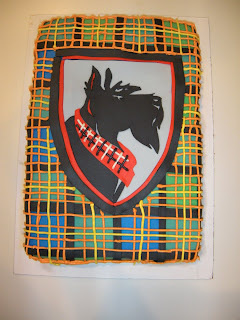 Flavor suggested by: Marie M.
This cake was for an old elementary school/middle school friend named Vania. She will be attending Seton Hall University this fall! A high school friend, Laura, hired me to make this cake for one of her best friends, Emily, for her 18th birthday. 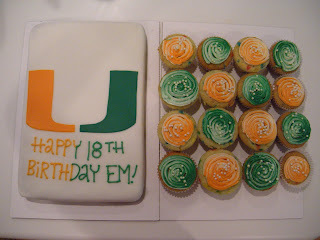 Emily will be attending UMiami this year. I made this cake for my friend Ben in honor of his graduation from high school. 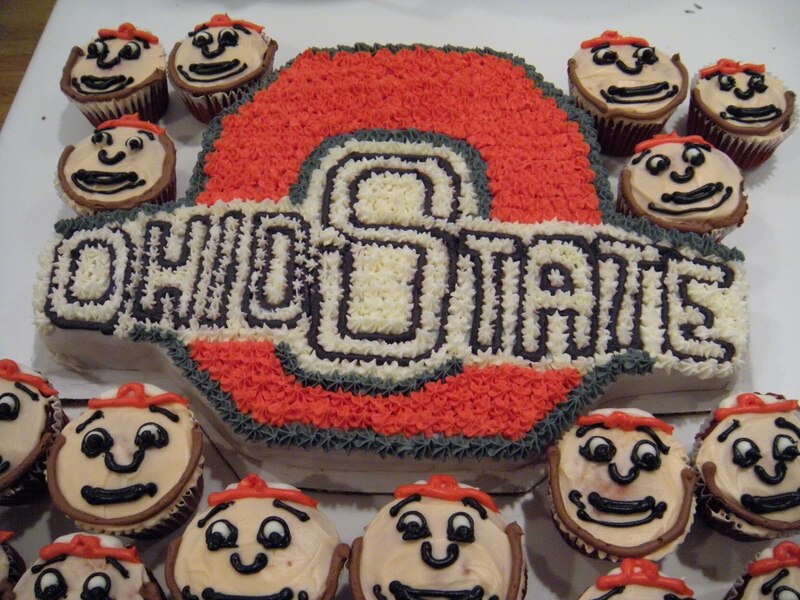 He will be attending Ohio State University next month! My brother's friend Reid hired me to make these cupcakes for a friend's daughter. 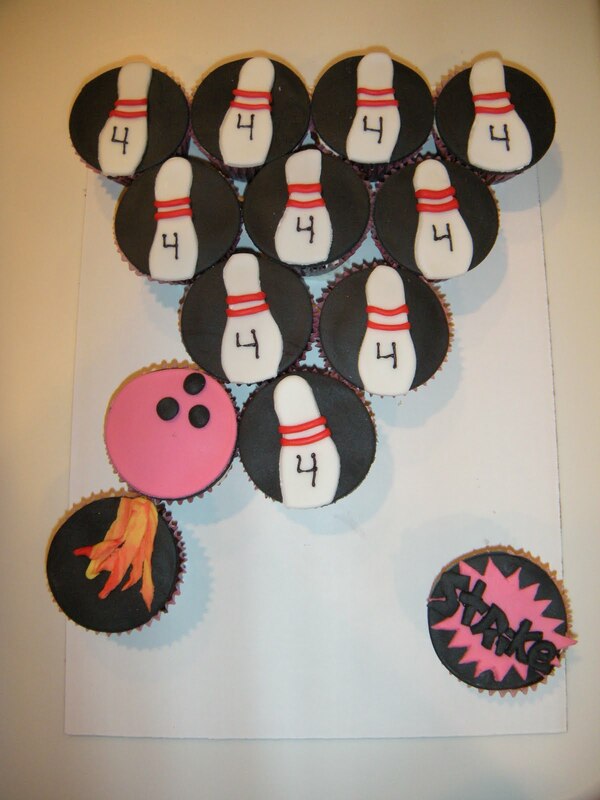 They were having a party at the bowling alley for her 4th birthday and Reid told me to just go for it design-wise. I had a lot of fun with these ones. 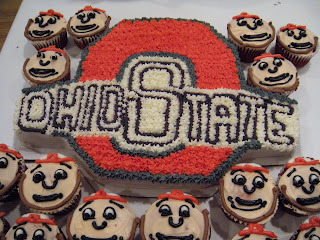 Hopefully Jen over at Cake Wrecks would approve of this CCC. I didn't want to overwhelm with banana flavoring, so I made the cupcakes just strawberry instead. 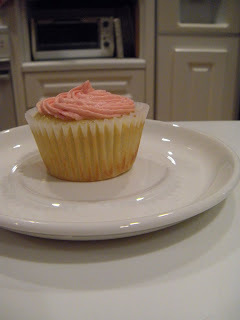 I used strawberry banana yogurt with cream cheese to make the icing. Aside from the fact that it was a more gooey icing, the cupcakes were pretty good, especially when refrigerated. 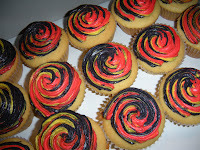 Flavor suggested by: Joey H.
So before you are utterly repulsed, let me explain the background and reaction to these cupcakes. 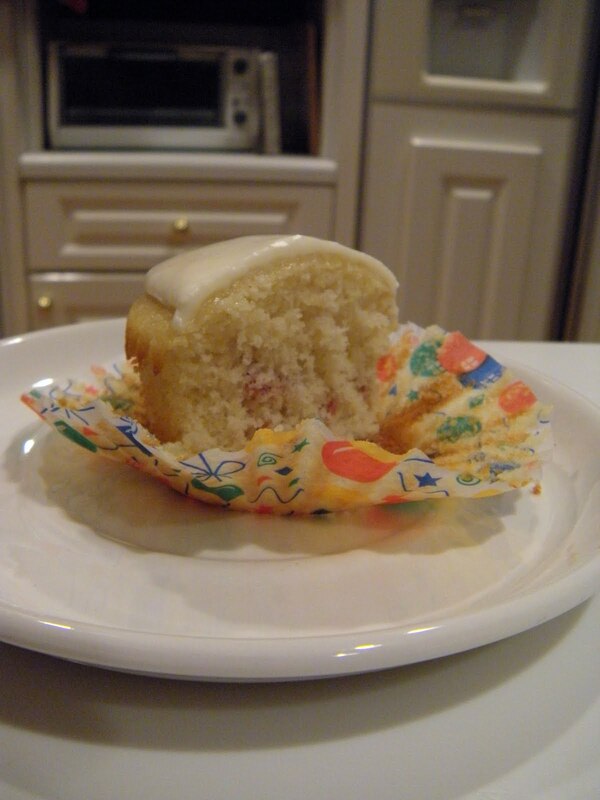 My friend, Julie, heard a segment on NPR about a man and his wife who own a bakery where a hot item is bacon cupcakes. 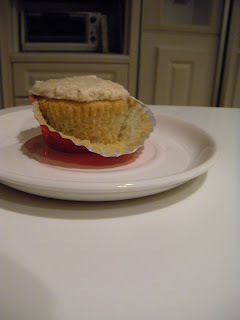 Eager to try this out, I decided I'd rather experiment myself then search for a recipe online--as with all of my "challenge" cupcakes, I don't think there'd be a point if I didn't complete the recipe myself. So I started with maple flavored bacon. I cooked a few strips in a skillet, patted every last bit of grease and moisture out of them, rolled them in a cinnamon sugar mixture, and folded them into a standard yellow cake. 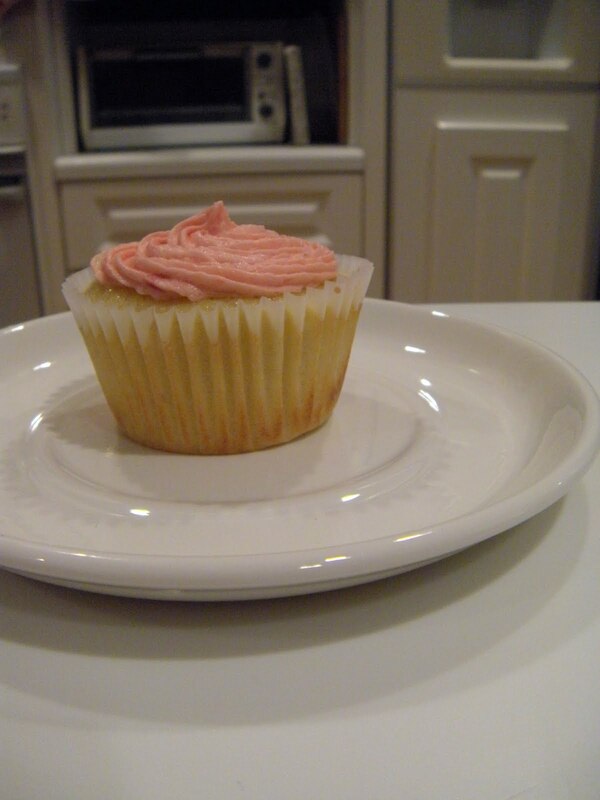 When they came out of the oven, it took me a solid hour to work up the courage to try them. I took a bite. Unsure of whether or not it disgusted me, I finished the cupcake and forced my brother to try it, too. 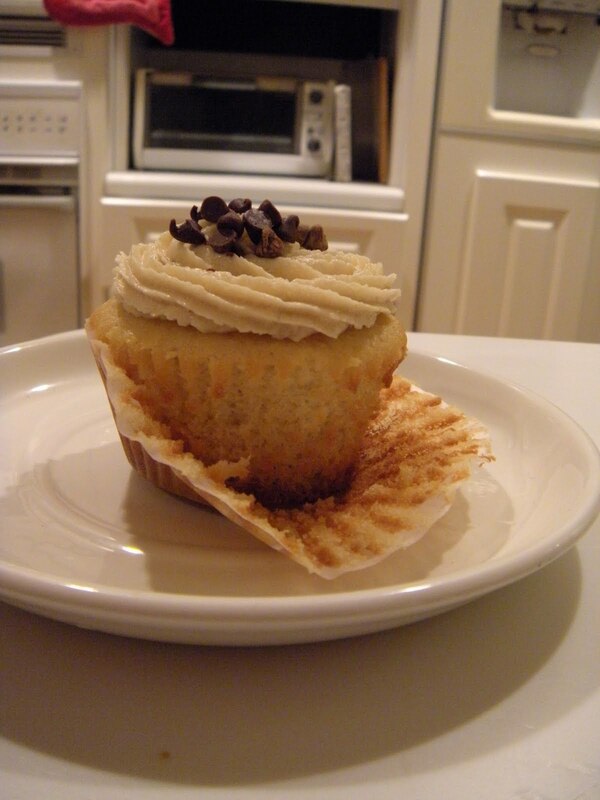 He gave it the okay and I set to work on the maple syrup cream cheese icing, which I definitely think will make a comeback on another cupcake very soon. 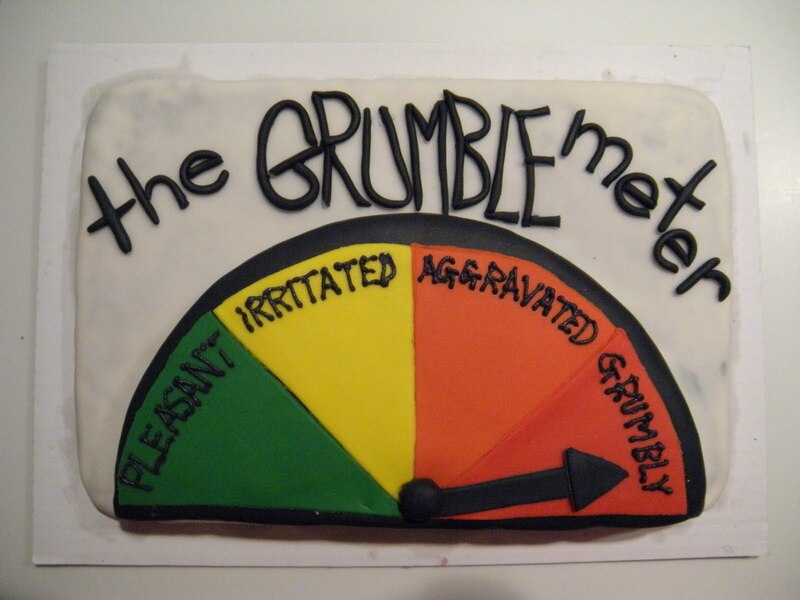 Once I frosted it with that, Thomas said it was definitely ready to go. I brought it to a friend, Shana's house first for her and her mom to try. They liked the icing enough that the cake didn't disgust them. Then I brought a trayful to poker night at my friend Mary's house. 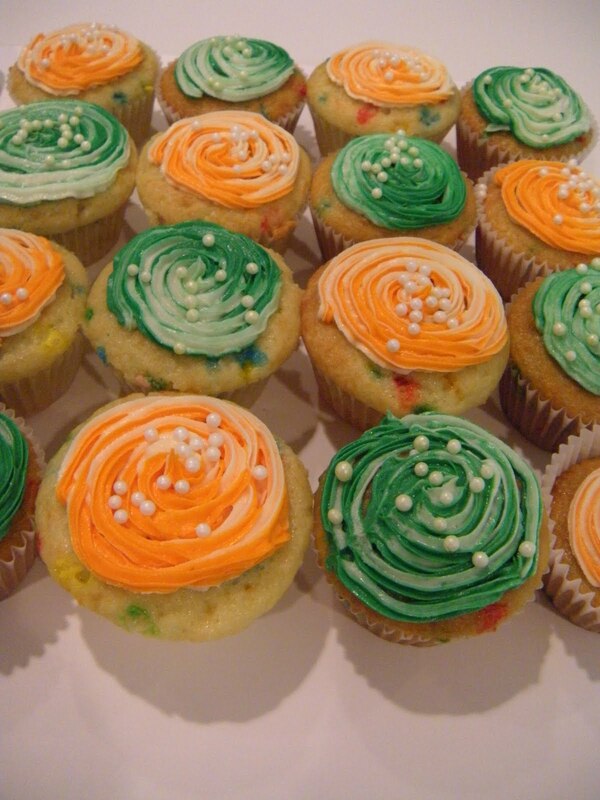 I gave the cupcakes a huge disclaimer: "They're hit or miss, you might not like them, I won't be offended, don't try it if you don't want to, tell me what you think honestly, etc etc." Three boys took the challenge first--and loved them. 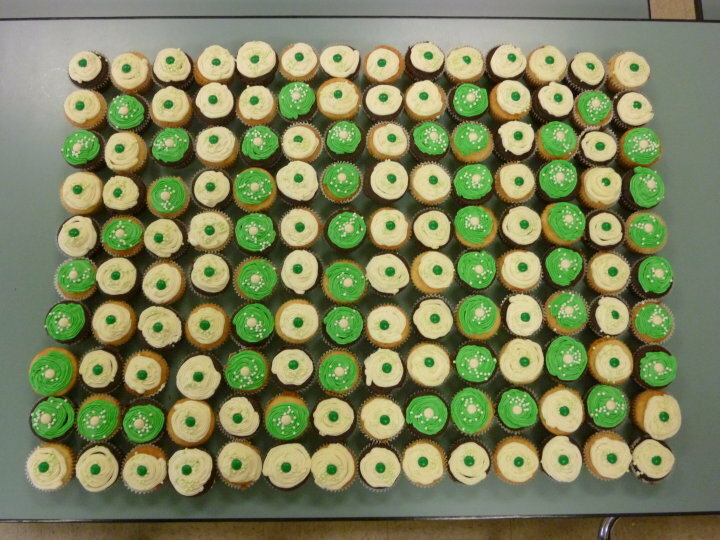 I thought they must be joking, because I definitely didn't harbor that much affection for these cupcakes. But they actually enjoyed them! 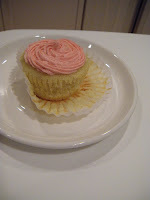 I thought they must be a "man cupcake", until two girls took the plunge and liked them too. As one friend said, "I don't even like bacon...but I like these." 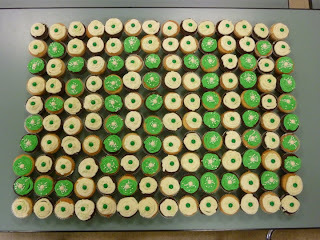 So they may not be kosher, or even socially acceptable, but these cupcakes were pretty successful in my opinion. If I make the recipe in the future, I might try using a spice cake instead to aid the bacon's flavor. 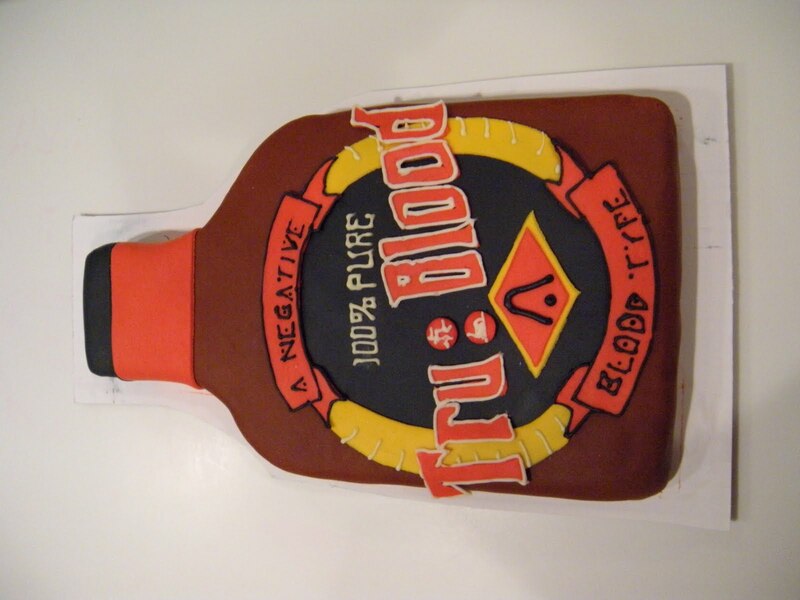 Flavor suggested by: Julie T. and Sam J.
I got an email from customer, Tom, a few weeks ago, who wanted a vampire-esque cake for his wife's "29th" birthday. Mary loves vampires (but no Twilight. Please, moms who fawn after underage boys are pretty creepy.) Anyways, so Mary and her daughter LOVE True Blood, and Tom sent me the above photograph to replicate. 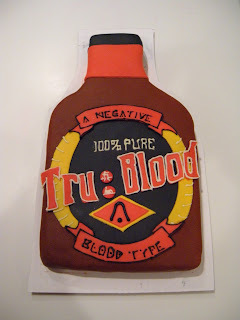 I'm really happy with how it turned out, and I can only hope it's acceptable for trueTrueBlood fans. I really enjoyed working with Tom and his family! These cupcakes, inspired by the children's snack, consisted of a spice cake base with walnuts and raisins, frosted with a peanutbutter icing and topped with chopped celery and raisins. 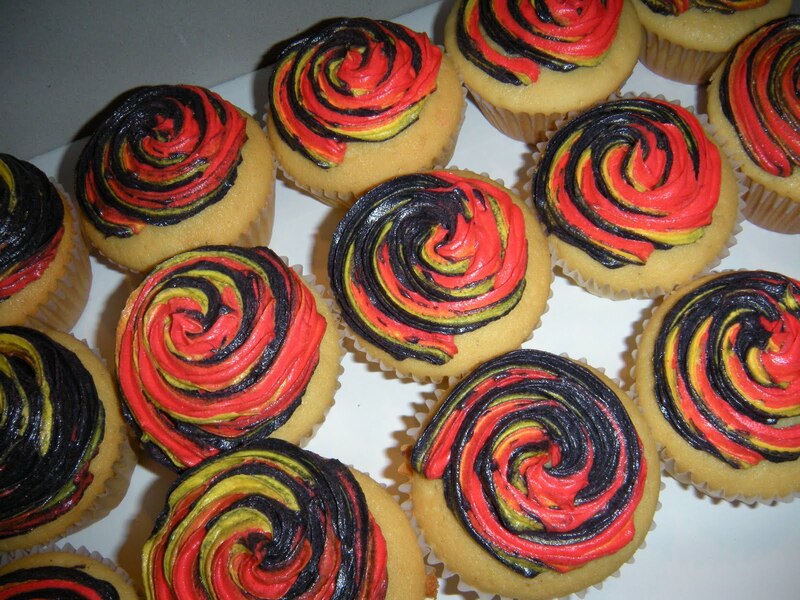 Flavor suggested by: Shanee S.
These cupcakes were made up of yellow cake, with cinnamon-sugar apples and applesauce folded in. 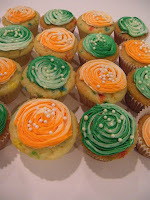 I frosted them with Cinnamon Cream Cheese Icing and served them to my friends on the Fourth of July! 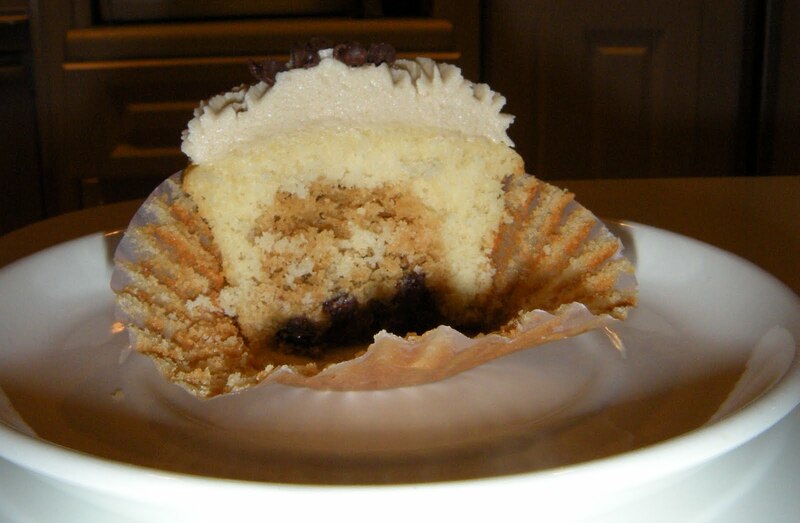 For my very first attempt at new flavor creations, I hid an entire piece of Pillsbury Break-n-Bake Chocolate Chip Cookie Dough at the bottom of each cupcake, allowing it to cook into the batter as the cake baked. I played around with the icing, using some brown sugar in place of a cup of powdered sugar. Success! Flavor suggested by: Chelsea R.
This cake was a week-long project. 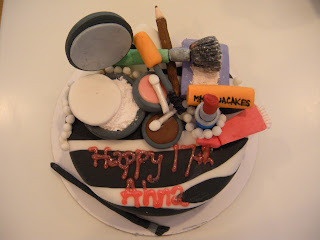 I used gumpaste to make the make-up models during the past week and finished by baking the cake and constructing it. 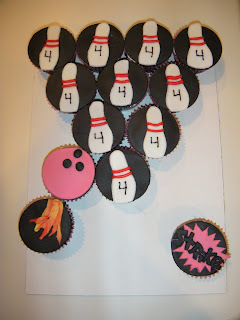 The cake was for a friend, Ahna, who exhibits funky and fabulous with her style and personality. 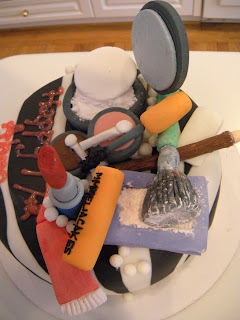 The compact used skin-colored powdered sugar to make foundation, the mascara was piped on with a thin stream of icing, and the lip gloss writing was made using a gel writing stick from the craft store. 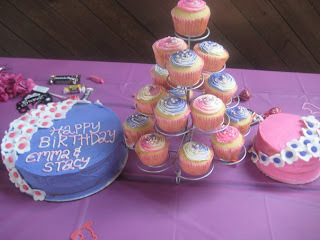 The silver was made using shimmer powder and the fondant covering the cake was designed in zebra print. This cake was for a 1st birthday party for a young girl in Virginia. 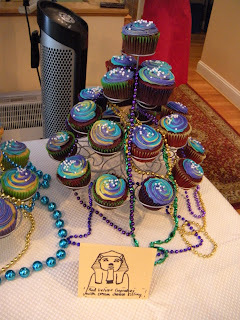 Her parents hired me to make the cake--she's a banana lover and the theme of the party was monkeys! 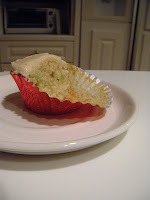 I experimented with a banana flavored cake (similar to banana bread but less dense). According to her parents, she ate 1/4 of the cake before they were able to stop her. 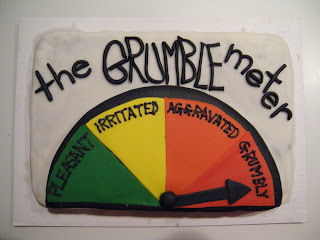 I made this cake for a fun, free-spirited friend, Rachel, in honor of her 19th birthday. It started as a weird vision in my head that turned into a reality. 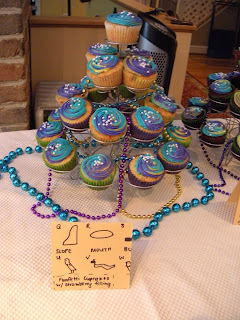 The cake was supposed to be whimsical and Alice-in-Wonderland-esque! 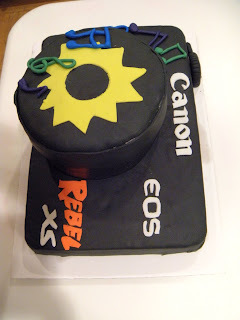 This is a redo of a popular cake of mine--the third try. 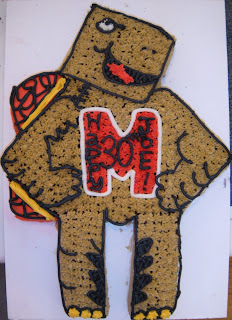 I made this for a Terps fan (and a party full of College Park graduates) in Fairfax, VA.